PRESIDENT Robert Mugabe has okayed a full-scale purge on all government officials and parastatal bosses linked to ousted former Vice-President Emmerson Mnangagwa, accusing them of deliberately sabotaging Zanu PF programmes and the economy for political expediency. Addressing thousands of Zanu PF supporters commandeered to participate in a solidarity march organised for him by party youths in Harare yesterday, Mugabe said all pro-Mnangagwa civil servants should be flushed out of both the party and government. “Go and eject them from the party. All his supporters, we do not want people who do not follow the norms of the party. You cannot be bigger than the party, no, no, no!,” he said. “There are some people who thought since the sun is about to set, they can deviate from the norms of the party. We do not accept such things. It doesn’t matter you have been with the President for so long. 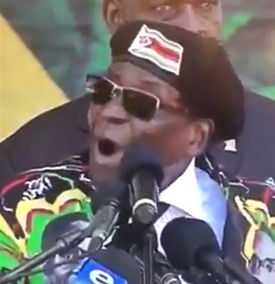 Mugabe accused Mnangagwa of consulting sangomas so he could be foretold when the 93-year-old Zanu PF leader would die. “People were told that I will retire in March, but I did not. Upon realising that I wasn’t, he started to consult traditional healers on when I was going to die. At some point, he was told that he would die first before me,” Mugabe alleged. Youth league political commissar Innocent Hamandishe called on Mugabe to sanction the sacking of government officials, board members of parastatals and party members for supporting Mnangagwa. The solidarity march also confirmed First Lady Grace Mugabe as the suitable candidate to replace Mnangagwa and fill the women’s quota in the presidium. Vice-President Phelekezela Mphoko and youth league secretary Kudzanai Chipanga both urged Mugabe to endorse the decision to appoint Grace as his deputy both in government and ruling party. Said Mphoko: “In 2014, you appointed me to be your deputy. You also appointed my colleague, but he is no longer with us. I am now lonely your Excellency, I felt it yesterday. Kindly appoint a counterpart for me.